Laurie W. Rush has a piece in Military Review called "Cultural Property as a Force Multiplier in Stability Operations: World War II Monuments Officers Lessons Learned" (thanks Illicit Cultural Property). 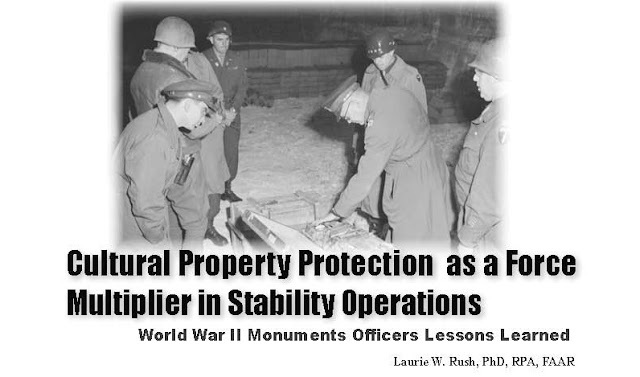 Rush, an Army archaeologist who has directed a well-regarded cultural heritage training program for deploying U.S. troops, recounts the role of the World War II Monuments, Fine Arts & Archives (MFA&A) officers. She highlights how that work not only protected cultural property, but also contributed to the larger war effort by, among other things, counteracting enemy propaganda designed to portray the Allies as lacking in respect for local culture heritage. current cultural property protection within the U.S. Department of Defense (DOD) have been relegated to voluntary "additional duty" status for a group of dedicated DOD cultural resource managers, lawyers, and other professionals. . . . DOD still needs an institutionalized program and process to engage the cultural property protection issue in a responsive, predictable, and dependable way that gets appropriate information to the right people at the right time. This initiative should come from the secretariat level. Consistent with Rush's recommendation, Article 7(2) of the 1954 Convention for the Protection of Cultural Property in the Event of Armed Conflict, to which the U.S. is a party, requires that states "undertake to plan or establish in peacetime, within their armed forces, services or specialist personnel whose purpose will be to secure respect for cultural property," although I am certain the U.S. believes that its current efforts, including the work of experts like Rush, satisfy this standard. Currently, a military museum in the U.S. has a decorative architectural feature removed from one of Saddam's palaces on display. The international laws of war forbid the removal of such an architectural element, and its current display as a war trophy illustrates the need for improved education on the issue. The piece does not discuss in any detail the special issues of Archives - the named, but junior partner in the MFA&A organization - but highlights the importance of protecting cultural property collections. For more on the work of the MFA&A during WWII, see the wonderful 1946 "Report of The American Commission for the Protection and Salvage of Artistic and Historic Monuments in War Areas" which is available in full-text online here - in my opinion one of the most interesting U.S. government documents there has ever been (discussion of the role of the National Archives begins at p. 41).